Congratulations! MaryAnn H.is the winner of the Scented Notes Giveaway for Lemon and Peppermint essential oils from Mountain Rose Herbs! Thanks so much for entering the drawing and supporting The Woodwife's Journal! Please email your mailing address to receive your prize! It's been two great years even though there have been a few slow spots! Thanks so much for following along on my journey! If you're new to The Woodwife's Journal, be sure to follow me, tweet me or pin me so you can join me on the next stage of the adventure! Lot's of new ideas planned for the coming year so don't miss a thing! Be sure to enter the giveaway for essential oils from Mountain Rose Herbs! You can enter for a few more days! Welcome to the first post in the Scented Notes series! The idea crossed my path again during my early mom years but was always tainted by the fear that there may be toxins in the store bought sticks and cones I found locally. It never occurred to me that I could make my own. Enter teenagers and their interest in saving the Earth, patchouli and the romance of homemade things to open my eyes to the charm of incense again. My friend, Sadie, @ All Natural Me always has that fresh yet earthy scent around her which seems the most natural thing in the world and prompted my oldest to ask her about her "perfume." Sadie tucks sticks of her favorite incense around in her life much like sachets and is rewarded with an aura of earthy goodness! After finding a specialty store nearby, my oldest bought nag champa sticks to cleanse the air in her room. A wonderful companion to the stretching and breathing exercises she'd begun. It was great but there's always that little "I can do this myself" thought that continually invades my mind. I'm afraid my daughters have inherited it, too. We discovered the how-to booklet at Mountain Rose Herbs but alas, she was off to college before we had a chance to try it because we realized we didn't have everything we needed to make the incense. 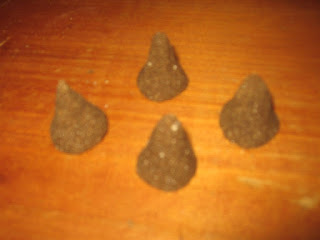 Well, since then, the folks at Mountain Rose Herbs have generously pitched in to get me started and look what we made! 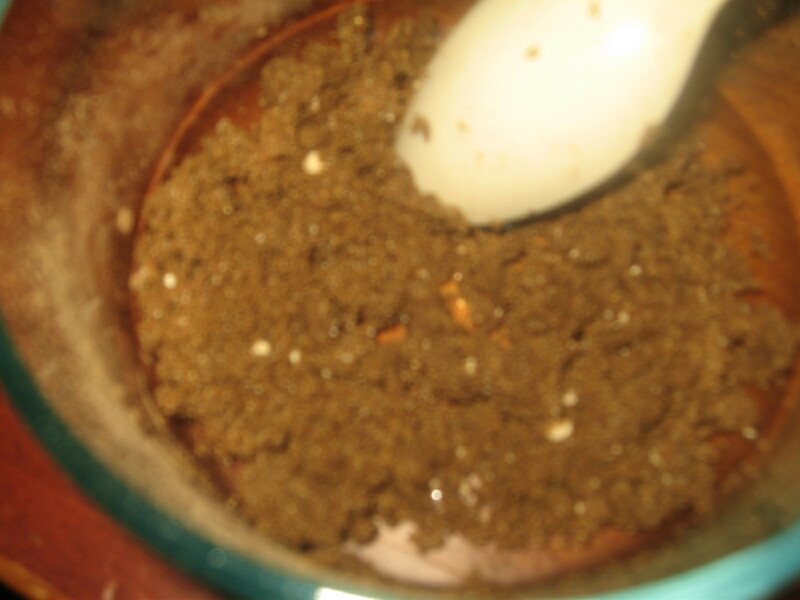 @ HerbMentor.com and we modified it a bit based on the ingredients we had on hand. 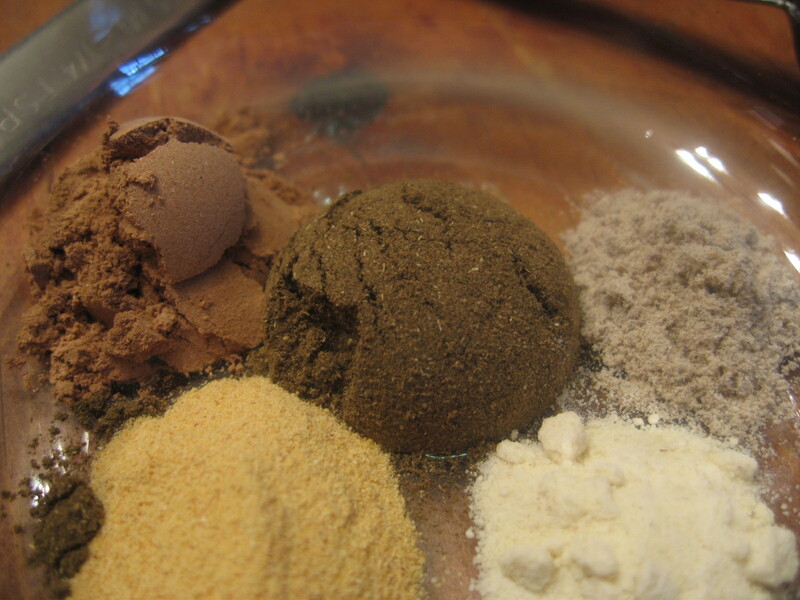 After mixing the powders together, add water a few drops at a time until the mixture is moldable. Form into cones. Dry 24 hours. Tip over to allow the bottom to dry out. Time to enjoy! Place your cone in a heat safe bowl and light. After burning for a few seconds, blow out the flame and enjoy the peaceful aroma! After the success of our first incense cones, we thought of using them for a more specific purpose. Since a few of us had been having trouble sleeping, we decided to substitute valerian root for the orange peel. And Voila! 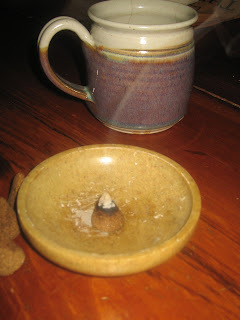 These incense cones, burned about a half hour before bed and carefully extinguished, promoted a good night's sleep! 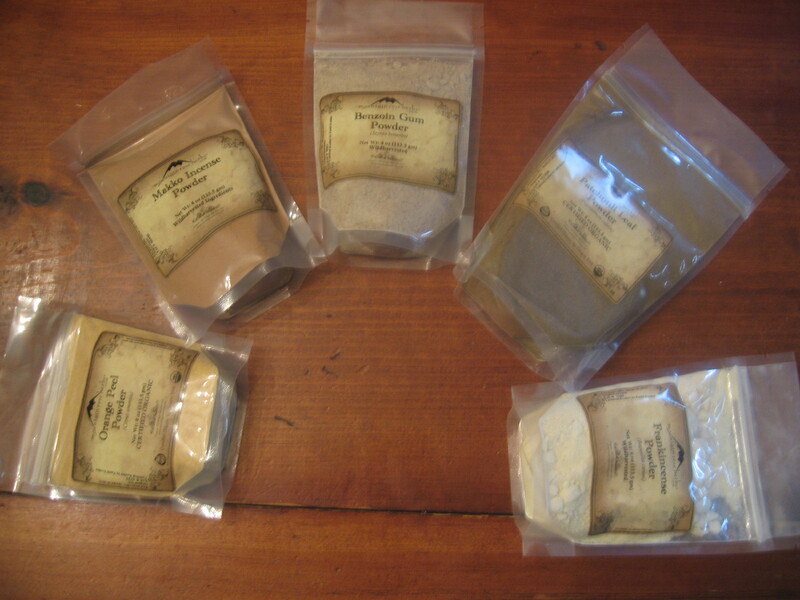 Check out the Incense Making Kit offered by Mountain Rose Herbs by clicking HERE. Or you can purchase the Making Your Own Incense booklet or other incense accessories HERE. If you already have some of the ingredients on hand but still need a few things you can go to the Mountain Rose Product Index to find what you're looking for by clicking HERE. Since 1987, Mountain Rose Herbs has been known for its uncompromising commitment to organic agriculture, sustainable business practices, and a steadfast focus on the pure aesthetics and freshness of botanical products. Their wide range of certified organic product offerings includes bulk herbs and spices, aromatherapy and essential oils, tea and tea supplies, and natural health and body care. Every aspect of product creation is carried out in accordance with strict quality control and organic handling procedures by employees who care. From fragrant and beyond-fresh organic herbs and spices to soothing essential oils and delicious herbal teas, the quality and integrity of Mountain Rose Herbs is unparalleled - with smiles guaranteed. They've generously agreed to send the lucky winner one bottle of lemon and one bottle of peppermint essential oil to get you started on your own incense adventure or for whatever you like...infusing, making your own cleaning products, herbal remedies, etc! Each month, with the help of some blogger friends, Annette is presenting challenges from her blog, Sustainable Eats, to encourage you to explore the homestead/farm life by taking small steps into sustainable living whether you live in a country setting or a downtown apartment. Join me, this month as I talk about turning your flowers and herbs into refreshing, healing hydrosols. Make your own hydrosol...take a picture, and share it on The Woodwife's Journal and Sustainable Eats Facebook pages and tell us how it went. Annette is also doing a giveaway to go along with this challenge. To enter, you'll need to try out the challenge, then leave a comment or link on her round up post at the end of the month. Go to Sustainable Eats for more info. What is a Hydrosol and why would I want to make one? Hydrosols are the offspring of the steam distillation process used to make essential oils. As the steam rises, water and oils combine until they begin to cool when they separate again. During this process, there's a little something from the oils that remains in the water creating a delightful liquid that can be used alone or added to other herbal remedies or cosmetics. This special extraction method creates a synergistic fluid that allows the subtle healing properties to be easily utilized. Lacking the possibly bitter, intense properties of essential oils and yet retaining unique, qualities of those oils in combination with the water soluble properties, hydrosols are unique and highly prized lotions. Hydrosols are anti inflammatory, astringent acids, that are soothing to the skin and many are pleasing to the palate. In the past, except for rosewater and orange blossom water, this wonderful byproduct was thrown away! 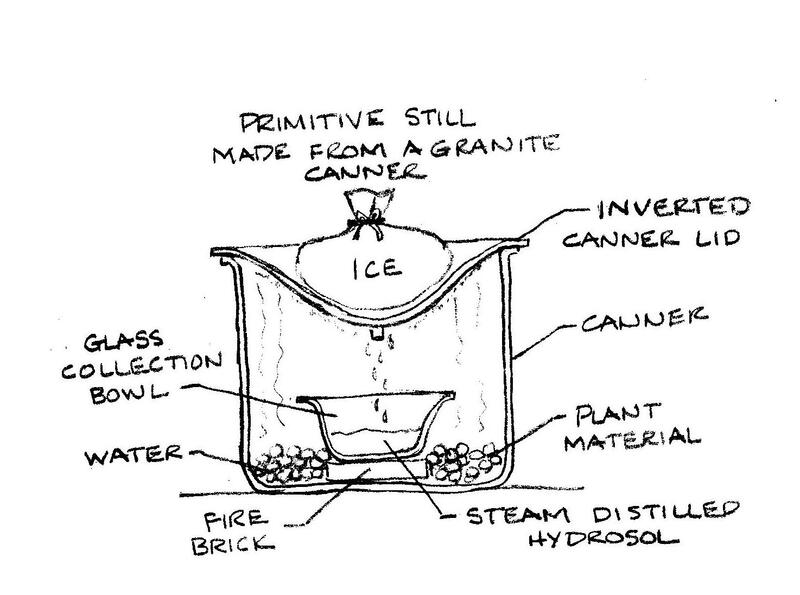 Not to be confused with floral or herbal waters, true hydrosols must be made by steam distillation. Floral and herbal waters, which are made by adding essential oils or plant material to water, do not contain the unique blend of properties that results from the marriage of both oil and water soluble characteristics found in hydrosols. 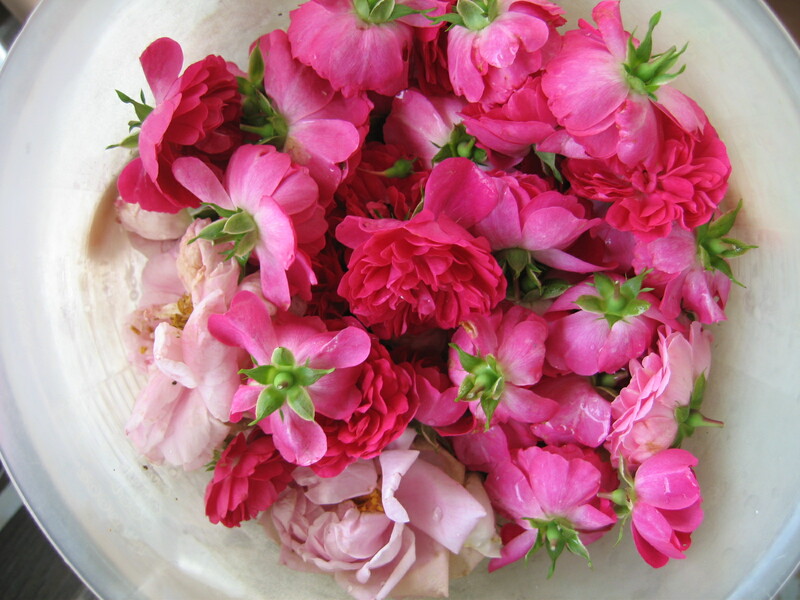 Roses are soft, fragrant flowers that lend a unique flavor to many dishes, especially in Middle Eastern cuisine. Here's how to make your own hydrosol. or a large kettle with a stainless bowl big enough to seal the top of the kettle. Place the fire brick in the center of the canner. The purpose of the brick is to elevate the glass bowl above the heat and the water. Keep in mind that whatever you use will be in the water so it needs to be clean and sterilized. Place gently bruised petals or herbs all around the brick on the bottom of the canner. Place the glass bowl on the brick. Put the lid on right side up. At this stage, you can let the water and plant material stand together (macerate) for a few hours if desired. 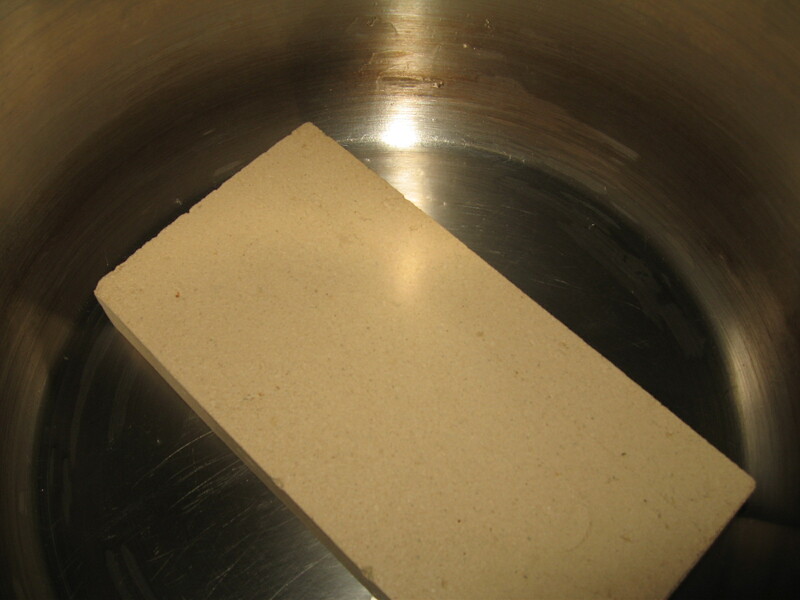 As soon as the water boils, invert the lid so that it dips down in to the pan. 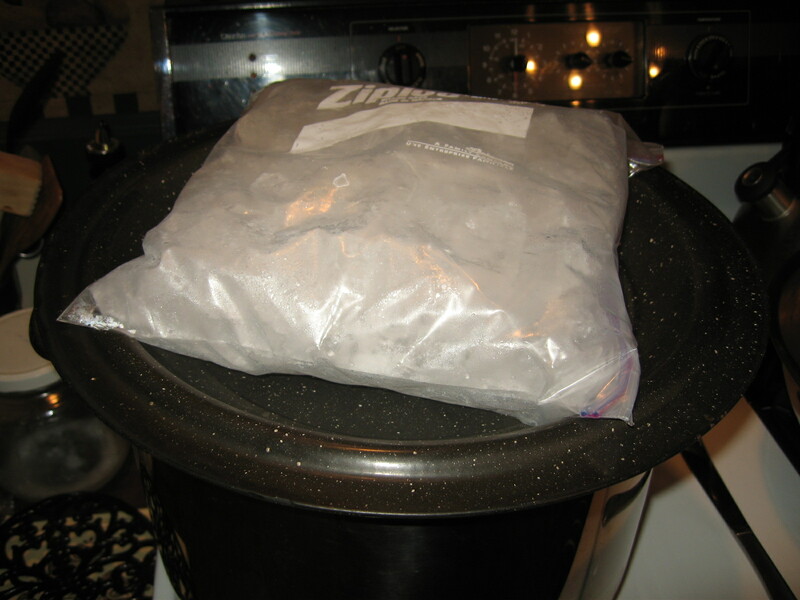 Fill the "bowl" formed by the inverted lid with ice (inside a plastic bag for easy removal). Gently simmer on lowest heat for 30 minutes or until the water is nearly gone. If you need to open the lid to check, just crack it open without completely removing the lid. That steam is valuable! Here's what's happening. You've created a crude still! While the water and plant material are simmering and evaporating, the steam is condensing on the cold, inverted canner lid, collecting and running down the convex lid until it drips into the collection bowl inside the canner. Pour the liquid in the bowl through a funnel into a glass jar. (I like to line the funnel with a wet paper coffee filter.) The hydrosol will flow through the wet paper but any oily residue left in the filter is essential oil! There won't be much but you can collect what's there with a dropper. Here's a cut away sketch of what that looks like. Cap the hydrosol jar and refrigerate. 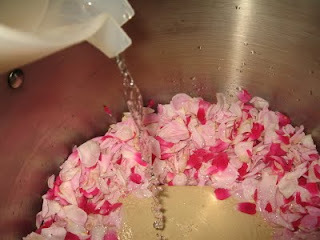 Varying reports on the shelf life say that the rose water will keep from one month to one year. If it develops a sour smell or taste it's time to discard it and start fresh. I like to put mine in spray bottles for ease of application. They make a refreshing spritz on hot summer days! 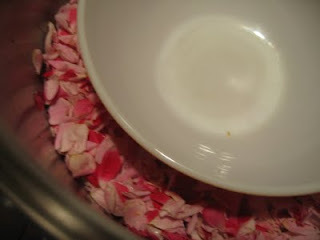 Rose water was supposedly Cleopatra's favorite! *I like to use my rose hydrosol after I've applied powder makeup as a moisturizing spritz to "set" my powder. Rose water can be used in cooking and cosmetics. Besides the lovely aroma, rose water is mildly astringent making it a great facial freshener for dry or sensitive skin types. I've added it to moisturizers and cold creams with great results. If you have a good recipe for Turkish delight, you know that rose water is a traditional flavoring. I recently found a recipe for rose water shortbread cookies I'm hoping to try out soon.